Production photos by John Flynn. In the corner sits a regular patron, an old man (Tucker Smallwood) wearing a fedora, his nose buried in his newspaper but occasionally piping up gruffly to impart a string of home truths to anyone within earshot. Early in the play he picks up a guitar and plays a brief but scorching blues riff. Sadly, we never get to hear him truly play… Rather, the focus of Roberts’ play is on the world-weary staff of the diner, who banter back and forth with an easy camaraderie. The language throughout feels authentic and true. Marylou Burl (Holly Fulger) runs the diner with her brother-in-law Buddy (Mark St Amant). One day her ex Sonny (Jeff Kober) blows into town, looking to reconcile with her, his brother and his now-adult and hostile daughter Julie (Lily Hollenman). But this is no casual reunion; Sonny has his reasons for showing up out of the blue. It doesn’t hurt that Kober is almost uncannily identical to Jeff Bridges, bringing that familiar charm and charisma to his character of an over-the-hill country musician. Jennifer Pollono is wonderful as the chatty waitress Kylie, merging a non-nonsense attitude with just the right amount of sweetness. Mark St Amant also gives a brilliant and raw performance, effortlessly conveying the burden of growing up in the shadow of his older and more famous brother Sonny. 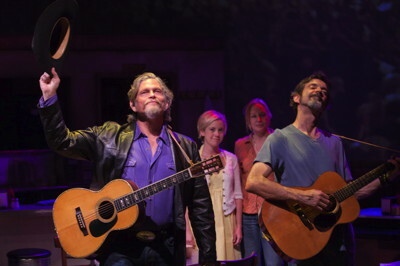 A highlight of the play is when the brothers pick up their guitars and sing. Beautifully directed by Mark L. Taylor, Where the Great Ones Run is a heart-warming play featuring some superb acting from all. Only two weekends remain so don’t miss this show! Reservations: 855-585-5185 or online here.